I love to do this: Look up cool movie locations. Ever wonder where some of your favorite horror movies were filmed? Some of these locations may surprise you. I’d like to hear which ones shocked you. “Twilight” Most locations were in Oregon. I recognized a lot of them and they included Oregon City which I consider to be the scariest town I’ve ever been in and I’ve been in some crazy backwater mountainous towns in Appalachia. If you watch the movie, you can understand why I think Oregon is Nirvana. 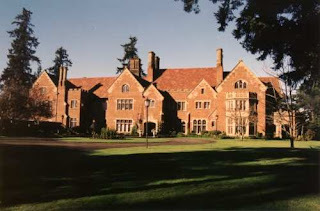 “Rose Red” The exterior shots were from Thornewood Castle in Lakewood, Washington. The interior shots were a giant set built indoors at a hanger at an abandoned Seattle Naval Base. “Signs” Bensalem Township, PA. No surprise here. M. Knight loves his home state. “30 Days of Night” New Zealand. They had to do a little to pump up the snow, as New Zealand wasn’t producing a lot, but filming was at the time of the year when it was winter there and summer here, so they had to go to the source. “Burnt Offerings” at Dunsmuir House and Gardens in Oakland, CA. I thought the home for this movie was really creepy. “The Covenant” Quebec and Nova Scotia Canada. Every time I see this movie, I feel like moving to Nova Scotia (another of my dream places to experience). Now that I know part of it was filmed there, I understand why I love the concept of this place so much. It’s probably as close to living in autumn most of the year as I could find. “The Fog” (original) Point Reyes Lighthouse, northern California. Loved this lighthouse. When I first saw the movie, I wanted to be that totally cool DJ (well, except for the part where the ghosts attack). “Gothika” Quebec, Canada. This was dark and dank. Seems like Quebec is a real fav to film at, along with Vancouver. They’ve certainly got the mood and weather. Every movie I've ever seen filmed in either location--I totally loved. “The Hills Have Eyes” Victorville, CA. It’s funny, when I lived in Redondo Beach, I used to think the movie had to be done in Victorville, which is where all the guys liked to go motorcycle riding. Every time I went out that way, I was really worried about the hills and felt like I was in the movie. “Jeepers Creepers” Bushnell, FL. I knew this one was in Florida for the movie, but I didn’t know they filmed it there. I figured they’d gone deeper into Alabama or Mississippi. “The Omega Man” Los Angeles, CA. I figured it was probably mostly on sets, although in the opening scene when he’s driving around in the daytime. He gets out of his car and in the distance, you see a single car cross a street far away—oops! “Salem’s Lot” (original) Eureka, CA. You know, in “Halloween” you knew it was filmed in California and not Indiana—there weren’t any autumn colors anywhere, just some dead leaves they threw at a fan and an occasional palm tree in the distance, but in this miniseries, I thought for sure it was filmed in the NE. Surprise! “Session 9” Lynn, Massachusetts. I wasn’t surprised. Seemed like somewhere in the NE. “Stir of Echoes” Chicago, IL. Felt like it. “When a Stranger Calls” (remake) Culver City, CA This was a big surprised to me. I got the movie (not because it was any good--it was awful), but I adored the house and setting. Sometimes, I just want a movie for the location only like “30 Days of Night” and “Cold Creek Manor” and “Wedding Crashers” where the setting was so much like Aspen Grove, it made me all misty-eyed. Do you know any other surprise locations? I've love to hear them.